You are correct. Help me raise my daughter? Is this a lame knockoff of the Dangerous Book for Boys / Daring Book for Girls franchise? Because those books rocked, and this idea is pathetic and wrong. Even worse, I think, is that Scholastic is listed as the publisher for these two. Oh, that is awful. Good thing we live in the 21st century, right? Appalling is the word, alright. As is the fact that Scholastic is the publisher. I wish I could take back all the book fair money I spent last week! I actually have the boys book, and actually read most of it! I'm not sure whether to be offended at the girls book or just start laughing hysterically?!! Please tell me that you're April Fooling us. Please say this is an April Fools Joke. And not the fun, slimey stuff, either. It's funny, my daughter is a total girly-girl and even though she's only three she's way into all things pink and frilly and sparkly and pretty. She came into that all on her own. If anything I tried to discourage it. (Only a little bit because it is fun having a girl who's such a little lady. I admit it.) I can see her loving a book like this when she's a little bit older. On it's own I don't think it's such a terrible idea. Put it next to the boy book and then it becomes disturbing and offensive. Strange how that works. 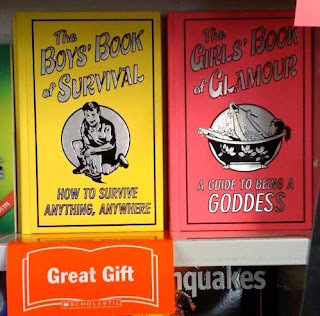 Anyway, we're the proud owners of the Daring Book for Girls so I guess we'll just stick with that. I was going to also ask if this was an April Fool's joke too, and I'm disappointed that apparently it's not. WAAH! I'm so happy I have boys.